I'm wonder how many kerning pairs i can manage without having exportation problem. I mean, now in the metric window (kerning selected) show me #206 kerning pairs (this means that in the TTF file exported with fontlab i have #10920 pairs) this is a right number? It looks like you refer to the (almost) obsolete kern table instead of GPOS pair adjustment. Better avoid it unless you are editing an old font. So after editing kerning pair on fontlab kerning windows what i have to do to make otf and ttf exportation efficient ? 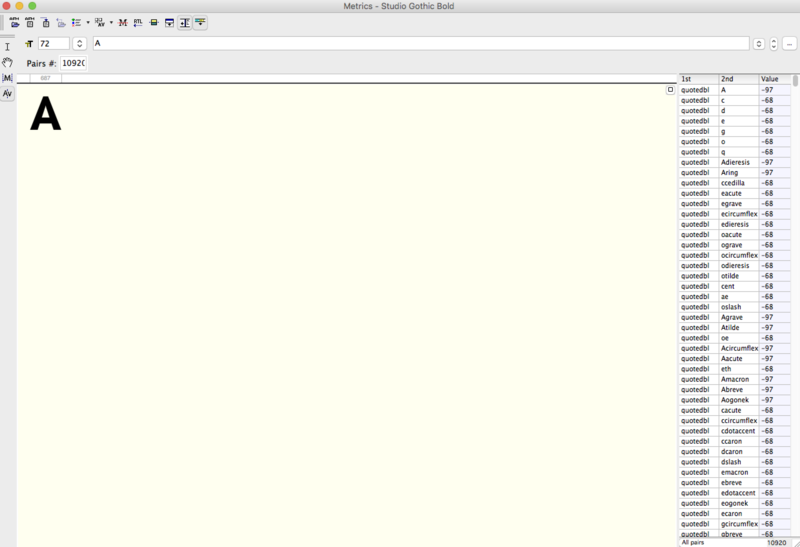 as you can see in the image below i have 217 kerning pairs grouped in classes. when i made ttf and otf exportation with trans type (from a ttf fontlab file) the result is files without kerning or at least without some kerning. Now i'm supposing that the kerning data is too much to be exported in ttf or otf files. The number of kerning pairs in a TTF is limited to 10,920 and if you have classes with pairs that exceed that number, then FL will truncate (If I recall properly) to that number. But your classes/pairs could exceed that number and will be fully exported to OTF direct from FL. I'm on a mobile device and the screen shot is difficult to read, but if you really have a "flat" 219 pairs, then they all will be exported from FL to a TTF. If "flat" means the total number of kerning pairs Including the permutation with each member of a class, this is not the case. So what i have to do in order to have a TTF file with every kerning pairs i set? is it possible or i just have to reduce them? Which is the difference between the kerning data expanded in the open features panel, and the ones stored in the metric panel (kerning selected)? ...and which is the difference between "export old style non open type kern table" and "generate opentype kern features if it...." in term of exportation? I really appreciate your help. Thank you so much. @Andrea T.: For OTF (and present day TTF) fonts you will only need to concern yourself with class kerning. There is a maximum amount of class kerning that a generated font can contain, but you should only start worrying about that the moment you exceed approx. 10,000 *class* kerning pairs. You don’t need to expand those classes. (those 219 pairs) needs to be converted to a "kern" feature when the font gets generated. 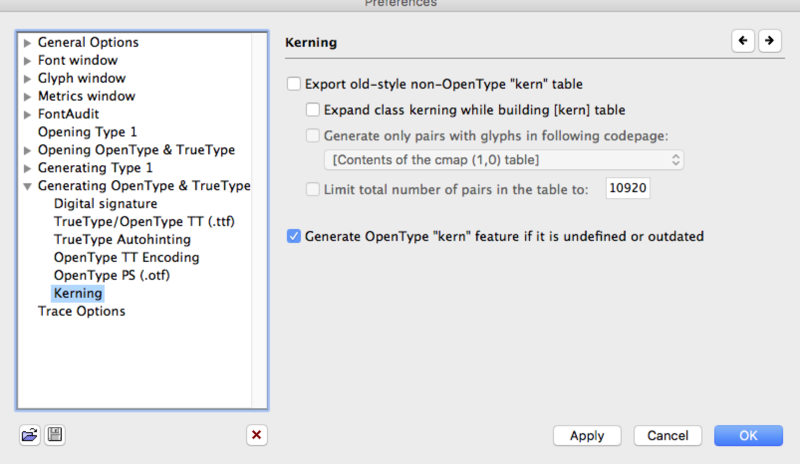 That is what the "Generate OpenType "kern" feature... " preference is for. Just leave it on. The preference to "Export old-style non-OpenType "kern" table" only applies to a very old standard for TrueType fonts. Don't bother with it unless you need to cater for very old versions of Windows. I don’t see any need to use TransType to generate OTF and TTF files. Why not generate them completely from FontLab? A lot of this is also explained in the FontLab pdf manual, which you can find in the "Help" menu. Thank you very much Paul for your answer! I think i execeeded the maximum number of pairs. Really, you don’t need to expand the class kerning *at all*. And if this is happening automatically then you need to check where this happens. 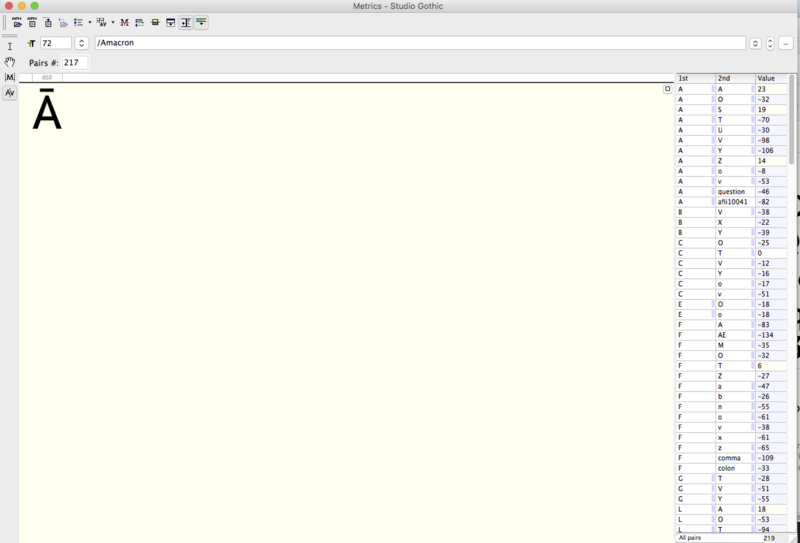 Stick to "grouped" class kerning and let FontLab generate the "kern" feature. Generate the fonts from FontLab directly, and make sure the preferences are set according to my previous post. That should do the trick. Thank you very much @Paul van der Laan everything works fine now!